With the inclusion of the Blue tick marks in Whats App which lets the sender know if his/her message is read by the other person has been getting positive and negative reviews alike. We can see the Blue tick marks if you are sending to a single person but if you want to check who read your message in a group with any number of users you can do that too with the latest update whichw as released few days back. The message read status can be known by checking the Blue Tick marks seen beside the message you sent in any chat box. These tick marks can be seen only when you send a message to a single user and this is not visible in a group, the below steps should be followed to check if someone has read your message and at what time was it read. 1. You can check any particular message which you have sent whether it is seen by others or not by following the steps mentioned below. Press on the message which you want to check and Hold until you get a toolbar on top of the screen. 3. You can see many options like a tick mark, number of messages selected, Delete, Copy text and Forward, but you have to tap on the “round” icon with “i” inside of it. 5. Here you will see the message for which you want to check the details about Read or Not Read and below that you can see “Read by” and the people who have read your message and below that the number of people remaining is mentioned showing the people who have not yet read the message you sent. 6. 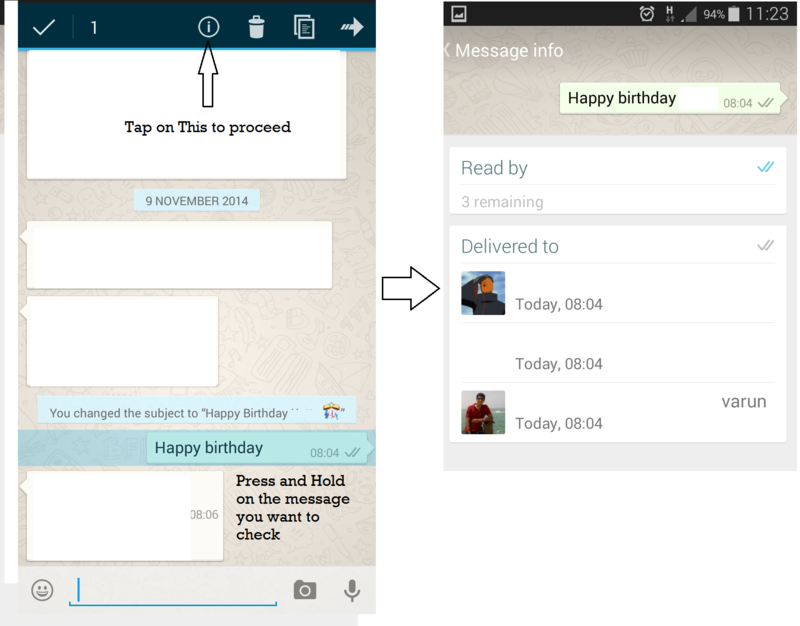 By tapping on any user in that list you can also check when your message was Read and when it was Delivered. The new options made available in WhatsApp are getting mixed reviews from users, some are happy that they can check who read their messages but are ignoring and not replying and some are not happy because the option of ignoring is gone as the sender can now know if you read the message or not. This can be a bad move by WhatsApp as many other chat platforms are coming up in competition and every move can cost dearly. WhatsApp groups are meant for conference chatting. All group members participate in such a conversation. In case of a WhatsApp group, you will see blue ticks only when all the members of the group have seen the message posted by you. Similarly, double grey tick will appear only when your message will have delivered to all the members. Before this you’ll see only single grey tick. I hae a question Hopei can receive an answer What does it mean when you tap on the “round” icon with “i” inside of it to check the status of the message sent. I sent a message yesterday and I receive one single grey check which means the message was sent but not delivered but when I tap the round icon. and it take me to another window where it says Read or Seen and delivered. The Seen feature has double blue check. But the double blue check is not seen when I sent the message, cause when I sent the message i get one single grey double check. Car to explain what does that mean?